Juice cleanses are like, so hot right now! You just have to jump on Instagram to see thousands of photos tagged with #juicecleanse to know that. Some people love the idea of juicing, others hate it. Some people think it is a great way to reset and detox the body, others believe only consuming liquid for 2, 3 or 5 days must be unhealthy. Valid points. I mean, each to their own. Prior to the weekend, my opinion was pretty neutral on it. I’d never done one before so how was I to make an educated judgement? However, after completing my 2-day cleanse experience, I am now totally an advocate! There are a bunch of different reasons why people decide to do a juice cleanse – for just a bit of a kickstart, a light detox or a more intense cleanse. Me, I did it for a bit of a reset. To get my body feeling fresh and most importantly, get my head in the right gear. I had been struggling with my food choices lately. Eating too much and not always making the healthiest decisions. I needed a bit of a kickstart – a reboot of my body but mostly my mind. I wanted to get back into a healthy mindset when it came to diet and making good food choices. A mental cleanse if you may. Before I got stuck into my 2-day cleanse I did a bit of research. 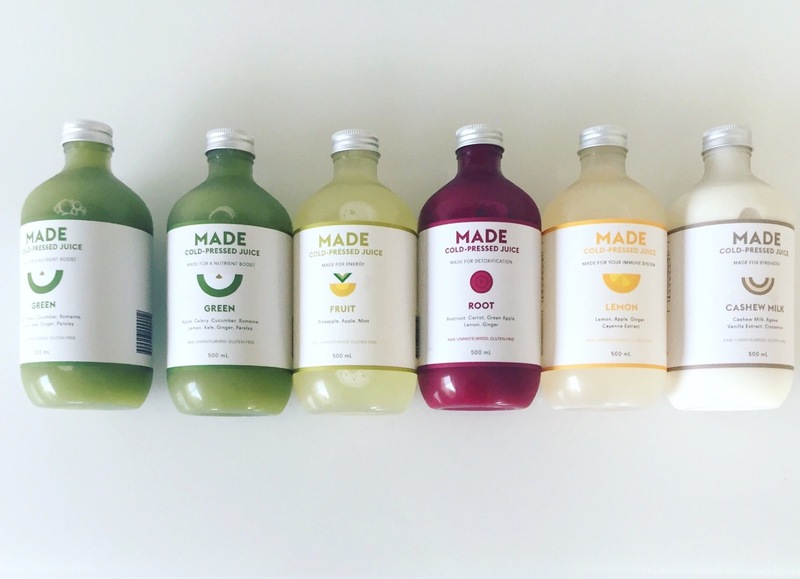 With so many brands and cold-pressed juice companies around now, I wanted to make sure I choose the right one. Made Juice was recommended to me by a friend and also happened to be the best value for money. Winning! Not to mention, the options they had available to suit all types of cleansers, was a huge draw card. It meant I could choose the cleanse that best suited me. I opted for the ‘made for health’ 2-day cleanse, but next time (yes, I said next time) I think I’ll try the next step up and get the ‘made for recharging’ pack. So what were my thoughts on the cleanse? I loved it. More than I expected to actually. The juices were filling and super delicious. Admittedly, I did have a bit of a headache on day 2 but otherwise I felt surprisingly energised. Post cleanse I feel incredible. Refreshed, reset and energised. Since finishing I have been less hungry and I all I want to put in my body is health and nourishment. Goal achieved! Were the juices tasty? Were they ever! My favourite was the ‘fruit’ and the ‘root’ juice. 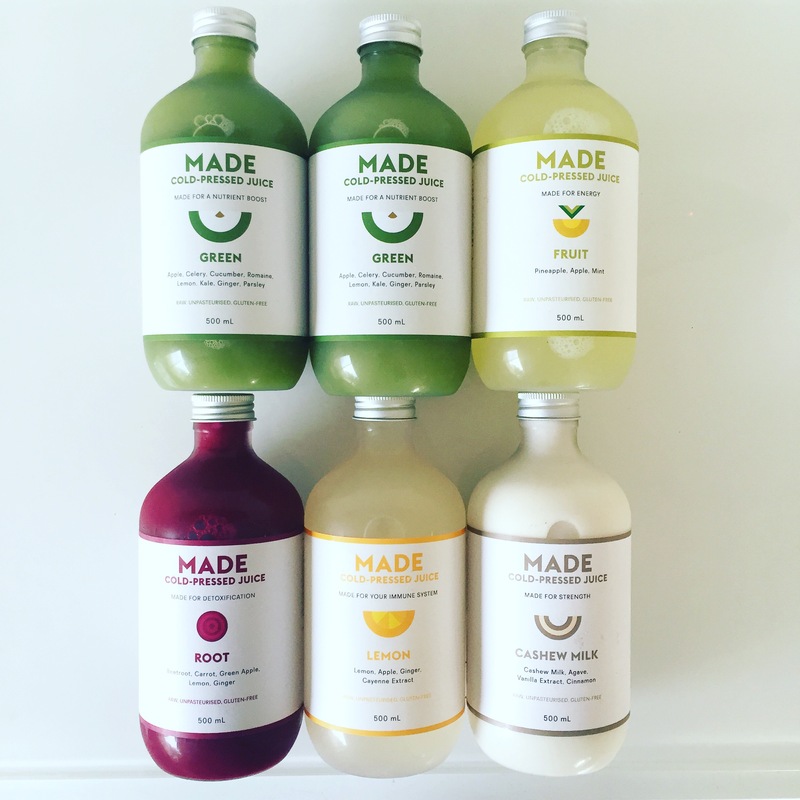 And as far as cold-pressed green juices go, the Made Juice one is the nicest I have ever tasted. Did I feel hungry? Truthfully, no. Any time I felt any kind of hunger pangs I knew it was time to have my next juice, which would keep me full for a good 2 or 3 hours. At the sight or smell of food, sometimes I thought I was hungry, but in reality I was just envious of something I couldn’t have. Take a toy away from a child, the child will only want it more. Would I do it again? Absolutely! Next time bigger and better! I don’t think I could ever commit to a 5-dayer though. 1. Think ahead and plan your cleansing days wisely. Perhaps do it on your days off or on a day you know you won’t be surrounded by temptations… Preferably not on a day that coincides with a social event or anything involving food. Seriously, don’t torture yourself. 2. Give your partner/friends/colleagues/housemates a bit of a heads up about your cleanse. You might get moody and you might get HANGRY so it’s in everyone’s best interest to be forewarned. 3. Don’t be around food. Seriously, if you can avoid being around food, avoid it. Seeing food, seeing other people eating food, smelling food isn’t fun when you know you can’t have it. It’s the old ‘we always want what we can’t have’ thing. 4. Distract yourself. Keep yourself busy. Read a book or watch some movies in bed (or in my case, multiple episodes of the OC). You’ll find being preoccupied will stop you from counting down the hours until you can eat again. 5. Get a buddy on board. Anything difficult is always made easier when you have someone by your side. Even just for accountability. I have to admit, at times I wished my boyfriend was juice cleansing as well so we could at least suffer (I mean, enjoy it) together. 6. Stock up on toilet paper. When you are literally only consuming liquid for 48 hours you need to pee A L O T! Part of the juice cleanse process is the elimination of toxins from your body – that means your kidneys will be working in overdrive and yep, you will need to wee pretty much every half an hour. 7. Master your mind. It really is a mind over matter thing, the ole’ juice cleanse. Half the time when you think your hungry for food, it’s not the case. The juices are quite filling and to be honest there weren’t that many times I felt famished. But when a certain time of day comes round in which you are usually eating lunch or dinner your mind can start to trick you into thinking you are hungry when you are not. So keep a strong mental focus and you’ll be fine. 8. Drink plenty of water. Drinking lots of H2o between your juices is necessary to stay hydrated and help the detox process. 9. Light exercise only. This one goes without saying. With less energy (food) going into your body, the less energy you should exert. Keep exercise to a minimum. Probably opt for some light walking over a heavy weight session or intense HIIT workout. 10. Enjoy it, Don’t resent it. Just enjoy the process. Be proud of your willpower and the fact you are doing something amazing to nourish your body. Notice how light and refreshed you feel and focus on that feeling accomplishment once it’s all over! No matter your reason for cleansing – whether to completely detox your body or just get your head back into a healthy mindset, I highly recommend giving it a go. What are your thoughts on juice cleanses? Love them or hate them? Have you tried one before? Leave me a comment below.